The party was supposed to be a Princess party but none of the guests wore any 'royal' outfits. Maybe because most of the guests were adults. Yep, there were only a few kids who didn't don any royal outfit as well. The party was held in one of the parks near our place. It was like a backyard barbecue so it was very laid back. We had burgers, hotdogs and pastas. Our little one had a blast because she got to play with some cousins who are near her age. She's the youngest in the group so they tried to take good care of her. We had a great time at the party. It got a bit chilly as the day went on but it was bearable [hint: I had a jacket ready]. It was great to catch up with family that we don't get to see often. aha,i am glad you all enjoyed the invitation.Happy Birthday to the little girl. so cute, kaya lang ang lagkit kaya niya, with all the icing haha. kakatuwa just looking at a little one. nice weather here too today in the high 40's no wind, and they say it will be in the 50's on wednesday. Ang cute naman nung birthday girl! I thought I'd see another photo of the li'l one. Salamat sa compliments, J! Sus, naman! For sure you'll still be like a sister to Erica even when she turns 15 or 25. You're not stressed kasi kaya you'll always look young. para siyang doll. so cute! i'm ok mommy J. hope kaw rin. enjoy the week ahead! Sounds like you had fun! 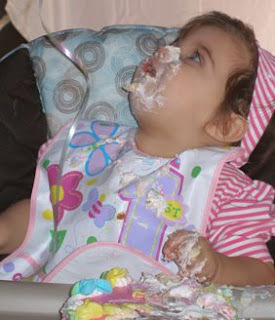 And look at that face covered in cake! That's a great photo.